Raising the Bar. Three print providers set new standards with digital print enhancement services.. In the last issue of DPS, we investigated several technologies that bring dimensional effects to digitally printed output. This week, we profile three print providers that invested in the technology to get an edge over the competition. Established in 1977 as a letterpress shop, today Presentation Folder, Inc. operates one 70,000 square foot facility and employs a staff of 50. While the print provider serves a nationwide audience, it focuses on the Western U.S., specifically CA, and is headquartered in Orange, CA. Joel Tardie, chief innovation officer, Presentation Folder, explains that the company operates with two core business models. The first is trade finishing for local printers, offering services such as spot and flood UV coating, digital raised spot UV coating, foil stamping, embossing, die cutting, and converting. The second is the production and sale of complete printed products, primarily presentation folders. Using a combination of experience, skill, and the latest in digital print and finishing equipment, the company provides a range of high-value printing and finishing to both sides of its client base. A diverse range of printing and especially finishing equipment allows for a variety of specialty offerings. For in-house digital production, the company relies on an HP Indigo 5600 digital production press, which offers many attractive features such as the ability to print on synthetics and high productivity of up to two million color or five million monochrome pages per month, producing color jobs at speeds of up to 90 pages per minute. Enabled by HP Indigo’s liquid ElectroInk technology and digital offset process, the device supports up to seven on-press ink stations. Targeting high-volume jobs, it includes white ink capabilities to create high-value, high-impact commercial applications. In addition, the print provider’s finishing offerings include state-of-the-art features attractive to its network of trade customers. Conventional finishing equipment, including UV spot coating, embossing, and foiling, is often utilized as well as an offline roller coater and many lamination machines for digital finishing needs. One device that helps set Presentation Folder apart from the competition is the Scodix Ultra Pro, which enables enhanced digital print features. With this equipment, the print and finishing services provider offers digital raised 3D UV effects that make its folders stand out. The product enables a high gloss, raised 3D look and feel that is comparable to embossing. Variable densities from one to 100 percent allow different levels of height and gloss to achieve tactile effects. The Scodix Ultra Digital Presses enable the production of tangible enhancements for a variety of applications including marketing literature, stationery items, book covers, boxes and premium packages, greeting cards, and photo albums with variable data capabilities based on a barcode system. For Presentation Folder, enhancement work often includes logos and photos. Tardie says the shop enhances photos elaborately with Scodix because of the device’s ability to create sculpted, 3D effects with different levels and densities of the polymer. “Our primary product is a presentation folder, but we have done many types of digitally printed pieces from business cards to flyers, book covers, invitations, postcards, and packaging,” he offers. The print provider recently accepted a job through a broker for a major golf company that wanted to create a package for its sales representatives to take on meetings to showcase the range of balls they offer. The package included a series of cards designed to emulate the actual boxes of different golf balls. The boxes themselves were printed on a metallic board stock using a UV offset press. To recreate the look, Presentation Folder used a metallic board stock and digitally printed them with white ink and CMYK on the HP Indigo. Then, the Scodix was used to emulate the embossing portion of the golf ball boxes. Tardie says the decision to print digitally on the HP Indigo was easy because the client only needed 200 or so copies of each version. A similar conclusion was drawn for the embossing. Digital was the way to go for both convenience and savings for these short runs. The project took a couple of weeks to turn around, but Tardie says this was mainly due to artwork revisions. He estimates the actual production was closer to five to seven working days. In the future, the company is interested in adding the foil attachment to its Scodix, but it’s not an immediate need as the shop still does well with its traditional foil stamping and embossing presses. The company is also considering a digital die-cutting option for short runs, and prototypes of custom die-cut pieces, especially packaging. Established in 1968 as a commercial printer and literature distribution service provider, Kelvyn Press Incorporated focused on the Chicago, IL financial services marketplace. The company expanded in 1998, and Financial Graphic Service (FGS) became the parent company, with a primary function of supporting financial services and insurance clients with their printing, production of annual reports, prospectuses, typesetting, and EDGAR filings. The company operates three locations, including its 80,000 square foot headquarters in Broadview, IL; a 230,000 square foot fulfillment location in Naperville, IL; and a third 50,000 square foot facility in Braintree, MA. In addition to its financial focus through FGS, Kelvyn Press specializes in corporate marketing and sales literature, direct mail, business to business communications, and promotional print. Services include traditional and digital print capabilities, a complete bindery, and mailing. Among its digital offerings, the shop invested in MGI technology in 2014 as part of its digital print department, purchasing both the Meteor DP8700XL+ Press and the JETvarnish 3D Spot UV Coater and iFOIL integrated finishing suite. The JETvarnish 3D features increased throughput for flat spot UV jobs and 3D raised effects. Tony Malacina, director of operations, Kelvyn Press, says he was drawn to the Meteor DP8700 due to its quality level and sheet size. “I’ve never seen digital equipment produce such high quality,” he states. While investigating the Meteor DP8700, Malacina recalls the JETvarnish 3D and iFOIL integrated finishing suite. Realizing the industry was headed in the digital direction, he knew it was important for the business to transition itself as well. He envisioned the MGI JETvarnish 3D and iFOIL finishing solutions opening a new segment of business opportunities. “We had a lot of clients doing small runs that wanted aqueous coating and crystal clear UV. To achieve this, we had to send the jobs out to be screen printed,” he explains. When Malacina noticed the capabilities of the JETvarnish 3D, he knew it could help eliminate outsourcing. 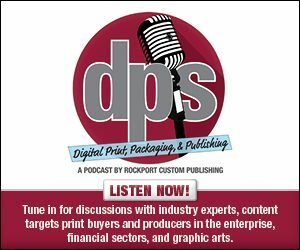 Since the investment in these technologies, the print provider has expanded its offerings, producing brochures, catalogs, invitations, envelopes, business cards, and books with enhanced print capabilities. The prototype options of the JETvarnish 3D and iFOIL allow the shop to experiment. He says there are many foil, color, texture, and substrate options to choose from and customers appreciate the variations of 2D spot coats, 3D enhanced textures, and embossed foil coloring. Malacina finds that selling customers on the benefits of its digital enhancement technology is a rather easy feat. The company prepares before and after samples of client work to highlight the impact and enhancements of the JETvarnish 3D and iFOIL products. In fact, he provides an example that hits close to home. “My wife is an author. She was printing her books and covers with a Web-based company. I begged her to give me a shot at the business, and when she finally set me up with one of her books, I did a couple of test copies using the MGI technology,” says Malacina. Once his versions were ready, using raised UV and foil, they put it next to her other copies from the previous print provider. “She’s already seen a 20 percent increase in revenue.” Since the test run, his wife has moved all of her book production to Kelvyn Press, which includes five novels and a novella. The print provider also teamed up with Susan Hampton to publish her first book of poetry. Titled Heaven’s Pen: Heaven Whispers & So I Write, the book was printed on the MGI Meteor DP8700XL+ Digital Press and the cover was enhanced on the shop’s MGI JETvarnish 3D and iFOIL print finishing system with embossed foiling and spot UV textures. The first run of the book incorporated spot UV coating, which was applied to the cover by the MGI JETvarnish 3D to highlight the design. However, Kelvyn Press decided that embossed silver foil details and text would make the design even more noticeable, and the team was able to quickly make the changes. As digital continues to grow, Malacina is considering adding another Meteor press. He says he hasn’t even scratched the surface on what he can do with his print enhancement capabilities. Making its debut in 2003, Fresh Color Press is located in Eden Prairie, MN with two locations set a few blocks apart from one another. Between the two locations, it has 24,000 square feet of operating space and 22 employees. The shop’s focus is creating high-quality digitally printed marketing collateral and direct mail products, serving primarily the Twin Cities area. However, the company also has clients throughout the Upper Midwest and a handful in other parts of the country. A 100 percent digital shop, the company has operated Kodak NexPress production printing equipment since its start. It also offers large format display printing, which was introduced in 2011. One of the features the shop appreciates about the NexPress is the Dimensional Clear Dry Ink offering for the fifth imaging station. According to Kodak, the feature consists of a dry ink that creates a clear “raised” layer on top of a page element after fusing. It can be used to enhance graphics, text, or a full-color image. The overall tactile effect is similar to thermography, but with a greater degree of control—the dimensional coating can be set to produce variable heights, so users can mimic the texture of a specific image. When the option was introduced, the shop was already running three NexPresses and immediately ordered the upgrade. Today, approximately ten percent of the NexPress revenue for the print provider utilizes Dimensional Clear Dry Ink. Brian Johnson, president, Fresh Color Press, says the company made the decision to upgrade to this capability because they thought there would be market desire for dimensional printing. In addition to dimensional coating, the shop also takes advantage of other fifth imaging unit options. Johnson says the next big thing for the company would be investing in the next generation of the NexPress platform when it is available.